It’s 2017, and the market for ebook readers isn’t what it once was. There have always been only a handful of major players, but Amazon has widened its gap and still reigns king. Kobo is reaching back to its well-reviewed 2014 Aura H2O to offer an alternative to the popular Kindle. Unlike the ebook reader market, the newly-refreshed 2017 Aura H20 hasn’t changed much at all. It’s still waterproof, and it has the same backlit 6.8-inch screen, with the same resolution. The major change? It loses the MicroSD card slot present on the original in favor of double the internal storage. That’s not a bad thing, though. The new H2O’s design and features aren’t any less impressive than they were the first time around. But on some level, the H2O feels like a missed opportunity. Kobo had a chance to disrupt a stagnant market, but decidedly played it safe. The result is a competent ebook reader that delivers on its promises, but does nothing more. The Kobo Aura H2O won’t be mistaken for a Kindle Paperwhite. It has a distinct, angular design that feels more rugged than its competitors. Thick bezels border its 6.8-inch E Ink screen, and a rubberized dimpled material stretches the length of its ergonomic back cover. It’s comfortable in the palm, and exceptionally light. 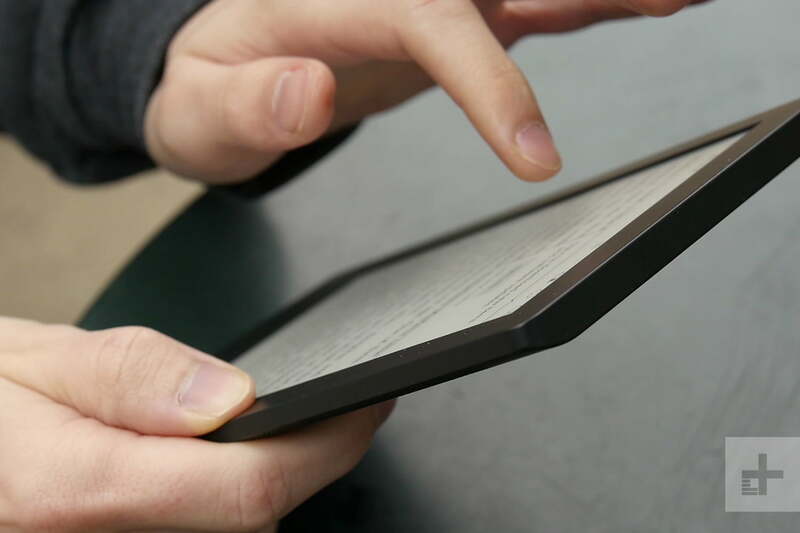 The bezels provide ample room to rest your thumbs, but we would’ve liked to see Kobo trim them a bit. The Aura H2O is minimalist. Kobo has taken care to conceal the Aura H2O’s ports and buttons, going so far as to recess the power button and move it from the ebook reader’s top to its back cover. It’s not as indented as we’d like, making it a little tough to find — the more you use the device, the more you’ll get used to it. What hasn’t changed about the Aura H2O (thankfully) is its water resistance. Just like the 2014 model, Kobo’s new ebook reader is waterproof: It ships with the company’s patented HZO Protection, which should provide up to 30 minutes of protection at a depth of three feet. It’s comfortable in the palm, and exceptionally light. We put Kobo’s waterproofing claims to the test by submerging the Aura H2O in a large bowl of water for five minutes. After we thoroughly dried it off with paper towels, it was good as new; the power button and the IR touchscreen worked as well as they had before, and we didn’t note any signs of damage on the charging port. You should note the screen does become a little unresponsive, and the device has trouble registering touches until it’s completely dry. Regardless, water resistance is always a welcome feature because it increases a device’s longevity and durability. Feel free to read with the Kobo Aura H2O in the bath — something you need to be a lot more careful with when using Amazon’s Kindle ebook readers. We’re pleased to see the Aura H2O’s screen is just as crisp and sharp as the original. The resolution and pixel density is unchanged at 1,430 × 1,080 pixels and 265ppi (pixels per inch), and we found text and book covers to be sharp — sharper than the cheaper 6-inch Kindle, which has 167ppi, but not as sharp as the Kindle Oasis, which packs 300ppi (and has a higher, slightly more comparable price point). All Kindles come with a 6-inch screen, so it’s nice to see Kobo offering a larger size for big-screen lovers who want more screen real estate. 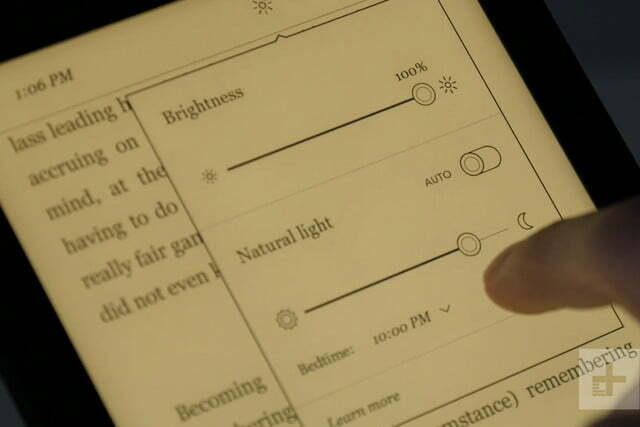 The device features Kobo’s ComfortLight technology, which produces a bright, tonally-consistent light across the Aura H2O’s entire screen. It also boasts a Natural Light feature, which adjusts the screen’s hue (from bluish-white to orangish-grey) to minimize eye strain. We found the “bedtime” feature, which automatically switches the screen to warmer, non-blue hues at a specific time, a nice touch. The Aura H2O performs just as well outside. 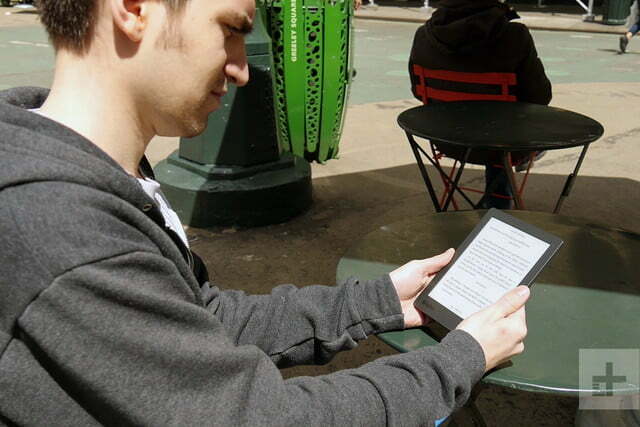 Thanks to Kobo’s proprietary glare-reducing technology, it’s easy to read in direct sunlight. Powering the Aura H2O is a 1GHz processor like last year’s Kobo Aura One, and it packs 512MB of RAM. That puts it more or less on par with Amazon’s Kindle ebook readers. Feel free to read with the Kobo Aura H2O in the bath. Despite the upgrades from the original 2014 device, the Aura H2O isn’t as snappy as we hoped. It took up to a full second longer to load books than Amazon’s 6-inch Kindle, for example, and it sometimes stuttered in menus — especially the search screen. 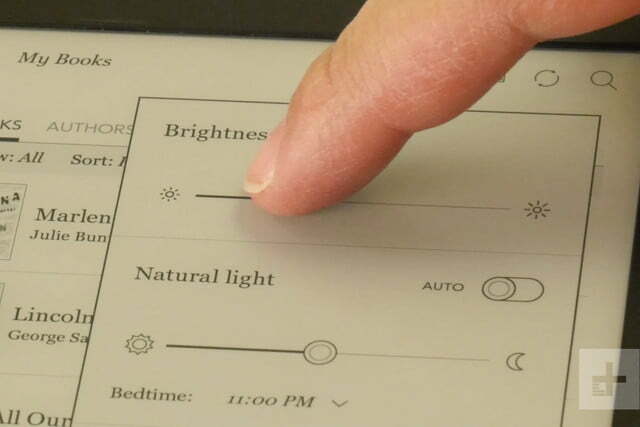 In ebooks, the E Ink screen refreshed a little too frequently for our liking — about every six pages. For comparison, the $80, 6-inch Kindle refreshes every five pages, and the $200 Kindle Voyage refreshes every 14 pages. The Kobo Aura H2O is $180, and it’s disappointing to see it doesn’t have a page refresh rate more comparable to the competition. One appreciable improvement is the internal storage. The new Aura H2O can store twice as many books as the original, up to 8GB worth. That translates to about 6,000 ebooks, which is more than enough for the average reader. The original did have a MicroSD card slot, which meant you could hold even more, but it’s highly unlikely anyone would ever go above 6,000 — we’re not complaining about the omission. One of the most appealing features of ebook readers is their fantastic battery life, and the new Aura H2O doesn’t disappoint. 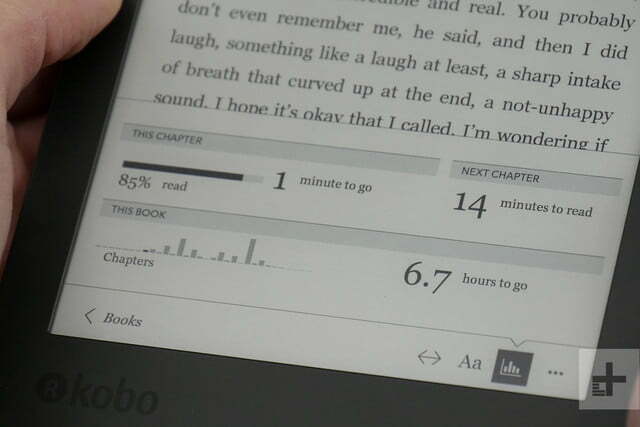 Kobo says it should last up to one month off a charger, which works out to about thirty minutes of reading each day (if you turn the page once per minute). The battery life estimate seems spot on. We tested the Aura H2O for about a week, using it for thirty minutes to an hour each evening with the brightness set to 50 percent and Wi-Fi enabled. 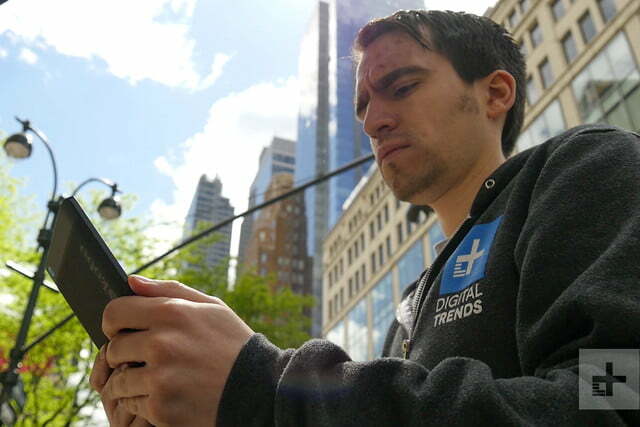 By day five, the battery life had dipped to about 56 percent. The easiest way to load books onto the Aura H2O is over Wi-Fi via Kobo’s store. It boasts about five million titles, the company says — about a million short of the the Kindle store’s roughly six million. It’s organized logically by section, and features curated collections (e.g., “great reads under $5”) that make narrowing down new titles easy. 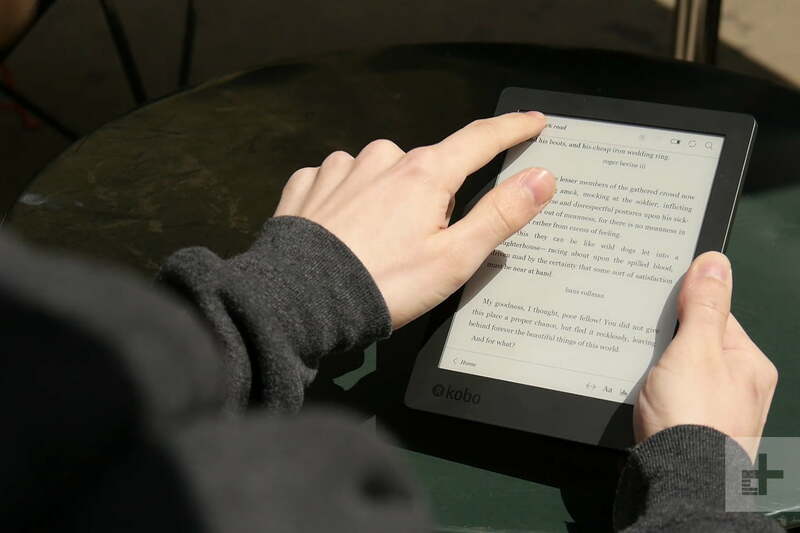 The Aura H2O has the added advantage of robust support for third-party ebook formats. If you connect it to a computer via the MicroUSB cord, you can transfer ebooks in EPUB, EPUB3, PDF, and MOBI from your computer’s hard drive to the device’s internal memory. Free ebook resources like Project Gutenberg and MobileRead will work just fine. But it’s important to note that Digital Rights Management (DRM) software will prevent you from transferring most books from third-party ebook stores. 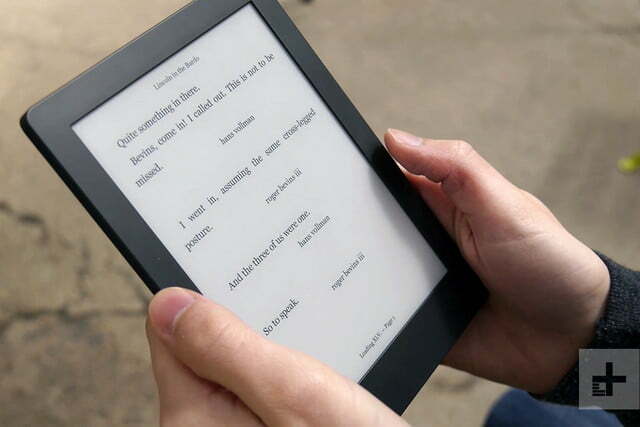 Some can be converted using Calibre, a free ebook management program, but if you download an ebook from the Barnes and Noble store that’s formatted for a Nook ebook reader, for example, you’ll have trouble getting it to a format the Aura H2O can use. Sadly, ebooks from Amazon’s Kindle library are also not supported. Kobo’s TypeGenius software, which powers the Aura H2O’s font-rendering engine, is impressively robust. It offers 11 fonts in 50 sizes, different weight and sharpness settings, margin and justification adjustments, in-book search, and note-taking tools. A preview window makes it easy to see changes before they’re applied, and TypeGenius’ page navigation tools make flipping back a few chapters a breeze. The Aura H2O isn’t as snappy as we hoped. An energy-saving feature automatically turns off the Aura H2O after a few minutes. 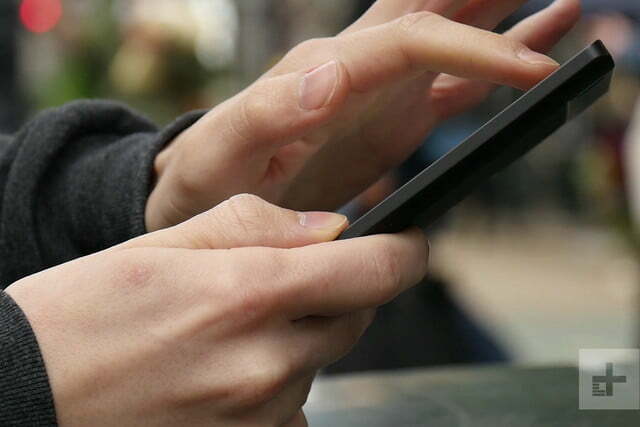 Reading controls let you fine-tune the appearance of pages. A web browser — currently in beta — lets you peruse sites on the H2O’s screen, thought we wouldn’t recommend it — the slow refresh rate will test the limits of your patience. 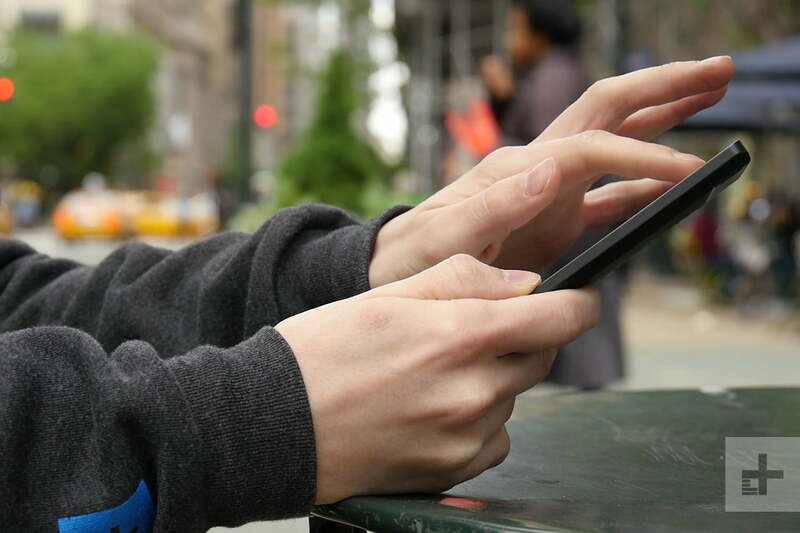 The Aura H2O’s Activity feature gamifies your reading. You can see stats like how many minutes you spent reading each day of the week, how many pages you average a minute, and how much progress you’ve made in your current book. An “Awards” tab offers badges unlocked by completing tasks like creating a Kobo account, using the built-in dictionary, and reading Proust. Kobo offers a standard limited warranty for the Aura H2O. If a defect arises one year from the date you purchased it, the company will replace it with a new or refurbished model of equal or greater value, or repair it using new or refurbished parts. You’ll have to contact Kobo to make a warranty claim and provide a proof of purchase, and ship the Aura H2O to Kobo’s repair facility. The Kobo Aura H2O costs $180, and you can pre-order it now. It will be available on May 22 in the U.S., Canada, the U.K., Italy, France, the Netherlands, Spain, Belgium, Switzerland, Japan, and Turkey. It will come to more countries later this year. The Aura H2O is every bit as good as the original, but we would have liked to see better performance. 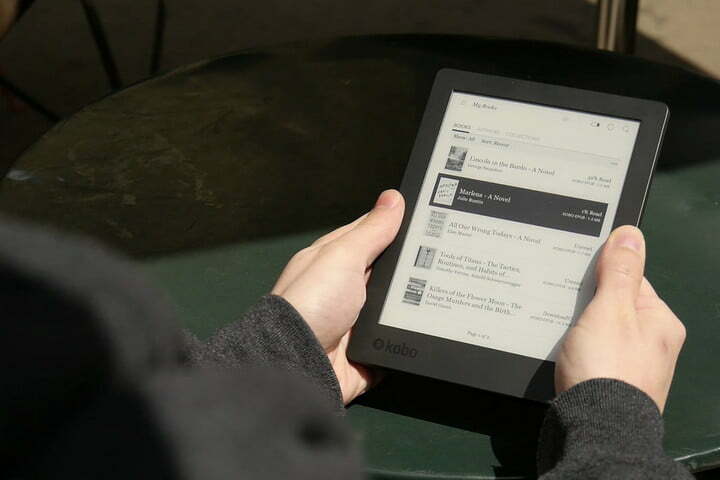 It’s a great option for people who prefer large-screen ebook readers. The Aura H2O’s build quality is exceptional – and the body’s waterproof. If the first-generation Aura H2O is any indication, we expect it to last more than three years. On the software side, Kobo’s devices tend to improve over time. The company introduces experimental new features via the beta menu, and just in February rolled out a revamped home screen interface to the entire lineup of Aura devices. Yes. The Aura H2O is a great ebook reader, but there are less expensive alternatives. Take Amazon’s Kindle lineup, for example. The entry-level Kindle has a smaller display and a lower resolution than the Aura H2O, but it boasts built-in Bluetooth, and starts at $80. The next step up, the $120 Kindle Paperwhite 3, bumps screen sharpness to 212ppi and adds 3G connectivity. The larger $200 Kindle Voyage packs haptic sensors, and there’s the $290 Kindle Oasis with a two-month battery life. The $100 Nook Glowlight Plus, another Aura H2O competitor, is also waterproof. Yes. The Aura H2O is a great ebook reader — it’s waterproof, has a blue-light filter, a large, sharp screen, and it supports a number of ebook file formats. If those features interest you, the Kobo Aura H2O is a great fit. It is a lot more expensive than the entry-level Kindle, though, so you may want to take a look at Amazon’s offerings first.